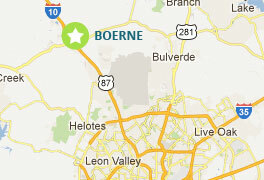 Boerne was founded in 1852 by German settlers and incorporated in 1909, the City of Boerne, TX was one of the area's most strategic transportation locations on routes for those traveling into San Antonio or the Texas hill country by horse, wagon, train, cars and trucks. Located slightly less than 45 miles southeast of Kerrville, and less than 25 minutes travel time from the suburban centers and amenities of San Antonio, the city has become a major tourist destination. The city's popularity is based on the establishment of many quaint shops offering antique and eclectic shopping in the historic downtown section.